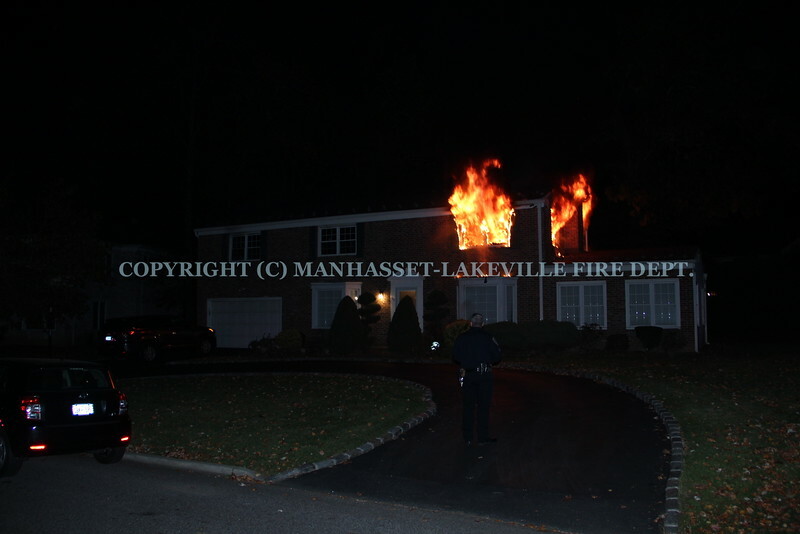 On Saturday, November 12, 2016, at approximately 6:34 p.m., M-LFD Companies 3, 4, 5 and the Ambulance Unit were dispatched to 59 Meadow Woods Road, in the Village of Lake Success for a reported bedroom fire. Deputy Chief Stone (8705) was the first to respond and was advised by M-LFD Dispatch that the Lake Success Police Department was on scene reporting a working fire. Deputy Chief Stone arrived within minutes and transmitted a Signal 10 for a working fire, with heavy fire exposing from the 2nd floor on his arrival. Engine 8740 was the first apparatus on scene and after picking up a hydrant stretched an 1 3/4'' handline to the second floor of the home to begin to extinguish the fire. A second hoseline was was then stretched by the crew of E8758. The Nassau County Fire Marshal's Office responded to the scene in order to determine the cause and origin of the fire, and all units were released from the scene by 9:30 p.m. by Chief of Department Kiess (8701).